Remember you are not just limited to what I have in stock - I am more than happy to make up a bespoke chain. Just e-mail me! 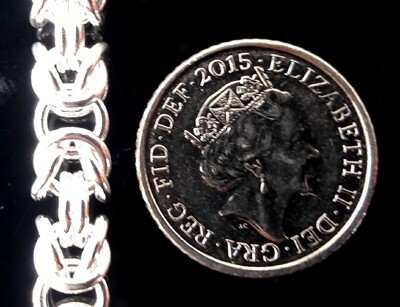 Heavy, hallmarked, beautifully pattened,chunky silver chain bracelet. Fantastic value, showy, textured, 5mm wide, 7 inches long, Byzantine pattern, weighs 21.9g. Only suitable for people with very small wrists (under 6 inches measurement round wrist).